Happy Tuesday, friends! Hope you’re having an awesome kick-off to your week! 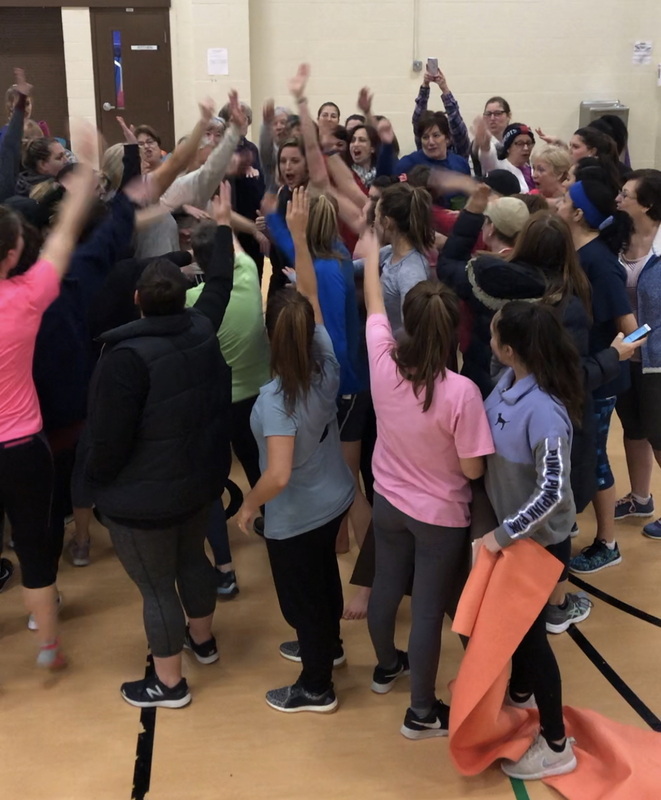 We recently just started our annual Fitness Challenge at our Rec Center and it’s so awesome to see so many of you wanting to get healthier, happier, & stronger in this New Year! I made sure I took some time to remind everyone that this is a commitment to yourself for a stronger future and there are many moving parts that go into your journey…but the magic sauce for success? Consistency! One of the top questions I get as a Trainer is what I recommend for quick & easy (higher protein) meals. I totally get it — not everyone likes to cook. And if I’m being 100% honest, I’ve lacked a little in the cooking department lately and have pulled most of my meals together from basic ingredients and toss them into a bowl. Is anyone here an OG reader and remember all of my “power bowl” creations!? I love adding roasted veggies, a carb choice, a protein, and fat to have a complete bowl. 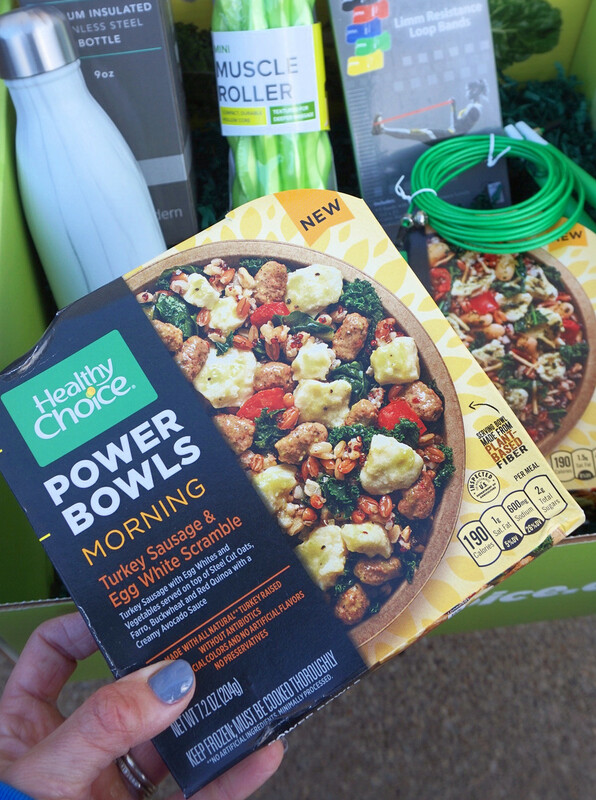 My friend’s at Healthy Choice are making it easier for me to not only have a new recommendation to my clients but to have “powerful” options for an on-the-go lifestyle with their new line of bowls. 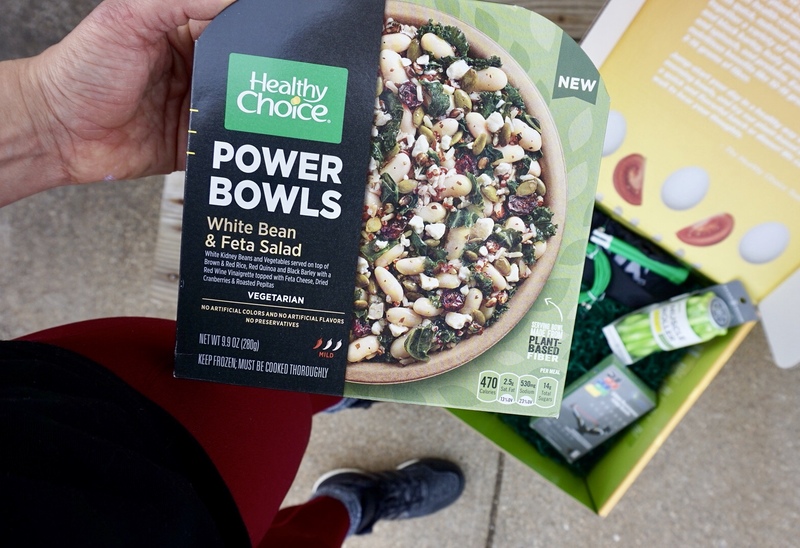 Healthy Choice now has vegetarian, non-vegetarian, & vegan power bowls that are nutrient-dense meals with quick, flavorful, well-balanced ingredients including proteins, grains and leafy greens, for morning or night! I am LOVING this Turkey Sausage & Egg White Scramble that has turkey sausage with egg whites and vegetables served on top of steel cut oats, farro, buckwheat and red quinoa with a creamy avocado sauce. I also tried out the White Bean & Feta Salad which is white kidney beans with kale, chard & spinach served on top of brown & red rice, red quinoa and black barley with a red wine vinaigrette topped with feta cheese, dried cranberries & roasted pepitas. 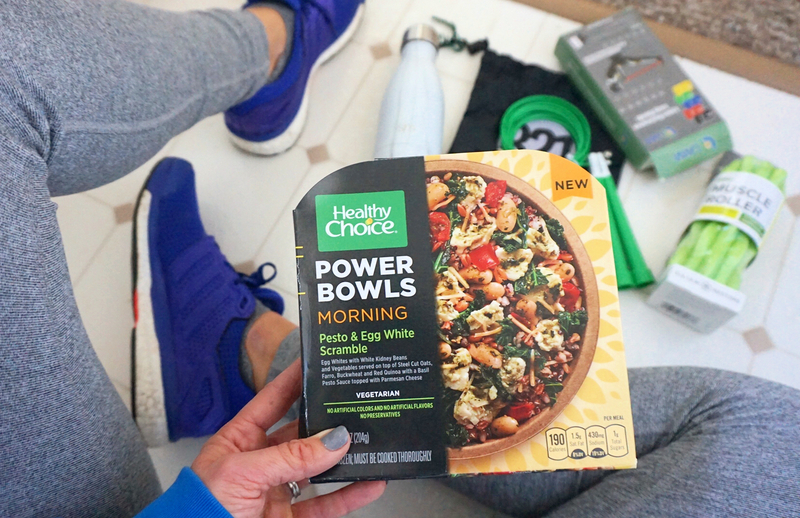 Andddd the Pesto & Egg White Scramble bowl is DELISH! When Corey & I recently drove home to Pittsburgh, I was STARVING right before we left so I ran back inside, heated up this breakfast bowl, & took it with me in the car. For a frozen meal option, these pack an awesome powerful protein punch which is what I’m always trying to find to make sure I’m getting in adequate protein each day. Along with my tip of FUELING YOUR BODY with an awesome nutritious base while finding a moderation that works for you, I put together a list thanks to this jam-packed babbleboxx. I don’t think you need to be chugging gallons a day….but you can benefit from a minimum of 50% of your body weight in ounces. Plus getting a cute stainless steel water bottle is a great way to look forward to your water! I’m always trying to remind my clients to focus on recovery after their workouts. It’s one thing to lift-all-the-weights, but it’s another thing to be able to move-all-the-body-parts. Foam rolling is a wonderful way to get some blood flow flowin’ & looking into a mini foam roller for on the go is a great option. Finding a maintainable and realistic amount of activity for your body is so important without going over-board. I always stress being CONSISTENT with your fitness journey and not trying to be perfect. Find things to do that you ENJOY that keep you active. Maybe shooting for 10,000 steps a day is a great goal for you and keeping a convenient jump rope in your bag for the gym or for on a walk is a great way to hit that goal. I can’t stress this enough. LIFT THOSE WEIGHTS, PEOPLE! There are SO many benefits to resistance training…and you can do this with simple equipment like dumbbells, kettlebells, cables, bands, & mini bands. I know that getting a sweaty sweat on is what leaves you feeling accomplished…but when you start to lift and progress each week with a new weight or resistance, you WILL start to love that feeling of STRENGTH. Balance is a hard word to throw around because everyone is going to have their own version of balance. When it comes to food, I truly believe in a balance of macronutrients (proteins, fats, & carbs) while also focusing on micronutrients like vitamins, minerals, & fiber. It’s important to not only FUEL your engine with these powerful foods, but also find a balance of ALL foods that you enjoy. 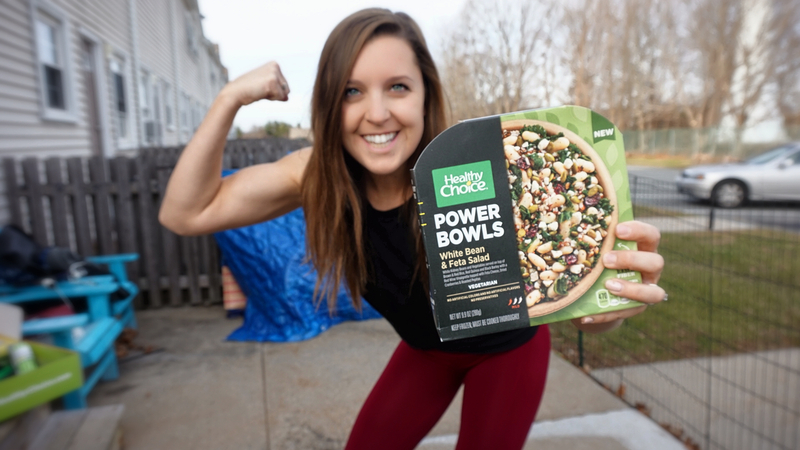 If you’re short on time and looking for an affordable meal option to have in the freezer, I highly recommend finding products with quality ingredients, substantial protein, veggies, & fiber….just like these Healthy Choice Power Bowls. What’s an area you think you can improve on? I personally want to focus more on meal prep, having easy options ready to eat, recovery & not neglect my stretching & foam rolling. This post is sponsored by BabbleBoxx.com on behalf of Healthy Choice, but as always, all opinions are my own! I didn’t know they had breakfast bowls! Will have to give it a try! I like the attitude ! good stuff ! can you answer this please? I’ve been doing some research and i found this article that looks really promising. it talks about a red tea program that was made in africa, which helps you lose weight and belly fat pretty quickly. I’m seriously thinking of buying this program, do you think it’s recommended? Those power bowls look great for a quick easy way to get a nutritious meal with healthy protein. It’s high intensity interval training. You definitely need the right power foods to fuel these kinds of workouts.